A stand-alone tie-in book to the SF TV-show Firefly. 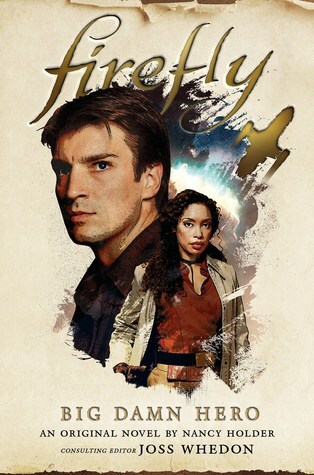 I’m a fan of the TV-show Firefly and when I heard about the new book, I was both anxious to get it and anxious to see if it could live up to the show. Well, it does! The book is aimed at existing fans because there are lots of references to various episodes. However, we also get some background info about the Tams and other stuff. I still recommend watching the show first and since we only got half a season, it’s quickly done. It’s set before the movie, in fact about middle into the season. Serenity is on Persephone, getting some repairs and a shady contract from Badger, the local crime boss. They need to get highly-volatile cargo to another planet before it overheats and explodes. However, Mal isn’t happy with just one contract. A business man contacted him about a possible job and Mal wants to at least check it out. The meeting is in a bar at a shady side of the city. Mal goes to meet the business man while Zoë and Jayne wait at the bar. It’s Alliance Day during with all of Persephone celebrates the day they joined the Alliance. Also, they seem to think that all Browncoats, who fought to stay independent from the galactic overlord, are traitors and should be killed. Of course, things don’t go well. Mal is kidnapped while Zoë and Jayne are in a bar fight. And the crew still has the highly volatile cargo to deliver. For a Firefly show/book, this is pretty predictable, especially the ending. However, otherwise this is, of course, return to the world and characters I love, so I can’t help but to like it a lot. However, Mal’s flashback didn’t really work for me. Almost the whole crew get a POV (except for River) chapter or two but the most POV time are given to Mal, Zoë, and Book. I love Zoë and Wash, and they’re great in the story. Also, since Mal is missing Zoë is the acting captain which was great, too. I’m really looking forward to the next ones.